Hi Redtags! There's a cold mass of air sitting over Central Florida and it will get down to freezing tomorrow night. I might have to move again farther south. I'm thinking about West Palm Beach, the land of dimples and chads. First let's start off with a Christmas newsletter from Ted and Marcy DYKES. 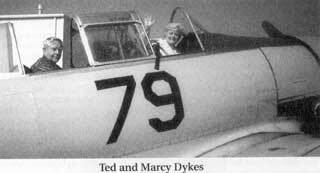 If the picture will reprint, you will see Ted taking Marcy on a plane ride in a WWII trainer in the Shenandoah Valley last October. It was a Christmas gift. And I thought I was late with Christmas gifts and cards. They both went back to Marcy's 40th high school reunion in Denver. Then they toured the state including where her great-grandfather was a general store proprietor in Cortez; the store is still standing. Next is a mail-gram from Larry and Penny GOOCH. Larry's company couldn't re-compete for a follow-on contract in Pasadena so Larry took a position with the California Space & Technology Alliance in Santa Maria. He's helping to "assess and recommend improvements to the state's space based infrastructure.' Their three daughters now have five grandchildren for Larry and Penny to visit and spoil. They all got together for a camping outing in Larry's new house - minus furniture-for a week in October. Slept on airbeds and sat in camping chairs. Sounds like fun. I got a communication from Bill and Sue HAUGEN. It seems that they managed to have several trips this year including a girlhood dream for Sue to visit England. Sue, Bill, daughter, son-in-law and granddaughter spent a week in Hyde Park. They loved it so much they are ready to go back anytime. I wonder how they liked driving on the wrong side of the road? Now for some sad news. In October, I received a call from Judy telling me that Daryl WOOD had succumbed to cancer on Oct. 11. He had fought it for 3 months. He deeply wanted to make the 40th reunion. She said that Daryl appreciated the letters and e-mails of support from Redtags. The family has started a memorial fund in Daryl's name to offer financial support for the Falconer Program at USAFA. Daryl was a falconer as you all remember from the sporting events when he performed with the falcons. God bless his soul. Remember him in your prayers. Charlie and Pat HALE sent a letter my way. They had some renovations done to their house that took a long time. They changed contractors and got it done swiftly. They had a small family reunion in Charleston, SC followed by reunions in Oak Island and Charlotte, NC. Both sons are doing well in California. Pat and Charlie have enlarged their guestroom, so stop by to visit them. Also got a newsletter from Charlie and Mary Jo PRICE. Charlie's company; Trus Joist, was bought by Weyerhaeuser last year and Charlie has been given responsibility for seven plants instead of one. They also have relocated to Atlanta, with a new house on a new golf course. Will Mary Jo get a hole-in-one on this golf course? Will Charlie tell us? Wait and see. Fran and Dave LEE sent me an update on the family. They did a lot of traveling including a return trip to Augsburg where Dave taught for a five-week special class. They managed to visit several other countries while they had the opportunity. They sold their house and are building a new one now. It will be ready in April. Son David II will keep an eye on the construction since he is in the renovation business. Son John is still an equity trader in Winter Park. Daughter Kelly is an assistant junior high principal in Ohio. Got a newsletter from Owen and Connie HAWKINS. Owen managed to stay up with the newest gadgets. Connie kept up with working at the convalescent homes, doing her duty as Equestrian Chairperson of the local club as well as riding her horse. Corey is engaged to his college sweetheart and will be married next August. I think that only leaves one or two unmarried children. I tried to keep up but get lost sometime. On behalf of the class, I thank Owen for providing the Redtag Net- RTBGeneral and RTBAnnounce- for our internal communication. Keep up the good work, Owen. Heard from Willie and Nancy GRAY. Willie flunked retirement and is doing consultant work for Lockheed Martin and Bechtel. He celebrated his Big 60 in Las Vegas and Nancy flew out to celebrate his birthday and their 33r' wedding anniversary. Nancy is still at the same school, teaching math and helping with special events. They both went on a long-awaited trip to Germany. They visited Munich with side trips to Salzburg, the Zugspitz, Rothenburg, Wittenburg, Berlin, East Berlin, and Quickborn, the birthplace of Nancy's grandmother. Then they headed for five days of shopping and sightseeing in Gay Paree. Son Larry is still in Atlanta but now works at a restaurant named "Front Page News." Daughter Christine is in her third year of working as a clinical psychologist at a children's clinic and children's hospital in Jacksonville. Got an email from George THOMPSON. He has returned to Russia to continue teaching at Pskov University. He continues to access the Redtag Net and answer many of the e-mails that blossom forth. He wrote to Art FARRINGTON with a copy to me, "The scheduling here is chaotic and I frequently have no classes. Then sometimes I have several, and I go to another institution occasionally and have a few private lessons sometimes also. But I try to remain 'plugged-in' so you guys won't forget me". Merry Christmas to you and Sandi and all. Cheers, George. Got this interesting e-mail from Ron TAYLOR. "Never cross paths with any classmates because we aren't traveling much. We live in a beautiful area with three great golf courses; so why travel"? We live in Savannah Lakes Village on the largest man-made lake (77k acres) east of the Mississippi but we are so far off the beaten paths that the people in the local fast food spots actually speak English. I am having a ball and doing great - finally got my golf scores and bowling scores to cross paths in the better directions. My news is actually about my wife, Bobbie. Four years ago she was given a 65 percent chance to survive five more years. Right now, they cannot find any cancer present at all. When we got engaged at the 1982 AF-Navy Game, she really wanted our friend and classmate, Jerry SINGLETON, to perform our ceremony; but he was transferred before our May wedding. Well, something must have rubbed off. Bobbie is now using her G.I. Bill to go full time to seminary. Maybe Jerry can answer my question: after she graduates, is her correct title "The Reverend Sergeant Major" or is it "The Sergeant Major Reverend?" (sounds like the oxymoron, military intelligence.) She is now in her second year, so I can get the answer at our 40th, reunion in 2002." Thanks Ron. I just thought I would advise you to find out if she has to take a vow of chastity. Got this one from Bob GIBSON. Bob's work is challenging and connections with the operational military are developing more rapidly. He finally got the opportunity to involve the Marine Corps in his activities which had been one of his goals. 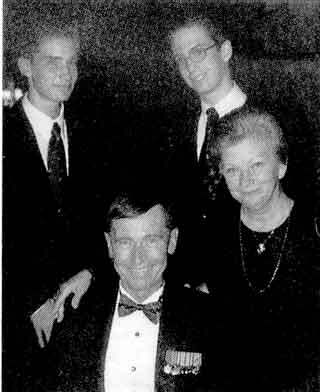 See attached picture showing the family at the Marine Corps Aviation Association reunion. Bobbie stays busy visiting Grandma two to three times weekly, volunteering at the library and chauffeuring the two boys to their school, practices, games, meets, matches, etc. Son Rob (17) is looking forward to being a college freshman. Steve is a high school freshman and trying many sports and activities. Got a newsletter from Gail and Peggy PECK "Only a couple of short trips in the little airplane including a long 4th of July anniversary weekend on the mid-California Coast. The Hearst Castle is a must-see and we followed up the surface tour with a low altitude air tour all the way from Big Sur to Morrow Bay. Spectacular! Daughter Jen graduated from UNLV and was the graduation speaker. She is now doing campus recruiting for Apple Computer and loving it. Liz is a freshman at UNLV and decided to major in Hotel Management. Jack, Claire and three grandchildren flew in for a week from London. Kayte and Kaipo had a daughter, Giselle. Gail is still doing his work at Neflis, a challenge every day. Peggy is doing great in her fight against cancer. "The cancer came back in her neck and the U of Texas M D Anderson clinic in Houston treated her. She spent a summer wearing wigs and kerchiefs after chemo but has now grown back enough hair to feel good about jettisoning the head covering. It is an ordeal for her to submit to the twice-weekly treatments locally and the frequent trips to Houston. But her attitude is great, as always. We are so thankful for the magic the doctors have been able to work for her and we continue to be hopeful for the long haul." And by the way, McCarran Airport is expanding and will be taking the Peck's house in the process. They will have a new address next year. Got an e-mail from Bo OHMAN. He and Nancy are back in Colorado Springs. He's working for Raytheon broadband satellite terminals for commercial and military customers. They will see more of daughter Nanette in the Class of 2001. She is in Bo's old squadron (2nd) and was the Fall squadron commander. She was a cheerleader and did well academically. She will be going to a pilot slot at Laughlin later in the Fall or early 2002. Son Nick and Jami presented them with their first grandchild in November, Class of 2021. Pat and Kent LAMMERS and the Ohmans made a trip to Puerta Vallarta in early December. If any Redtags are passing through C. Springs, give him a call. Mike and Kay BUTCHKO have purchased a house in nearby Melbourne (Florida) and moved in. I expect that we will get together with the other local Redtags soon. Got a large-size mug from Jim WHITTED. It was a mug from Jamba Juice, the commercial fruit juice company that has kiosks in major airports in the Southwest. The name Jamba is in large letters on front and back. I really appreciate the mug. Jim is still doing well in Los Angeles. The input for the next issue will be due in mid-March. The Checkpoints staff tries to get that issue out in time for the graduating class to receive it before graduation, so please send in your updates as soon as you read this column. In the meantime have a great NewYear and Go Redtags!